An informative article on Headache-how does a bite of ice-cream affect it? 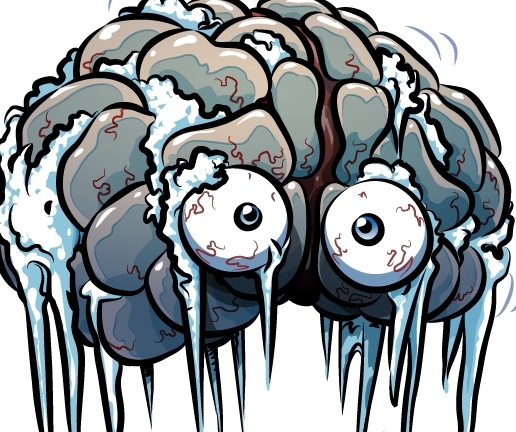 Are you familiar with the term "frozen brain"? If not, I will explain that term to you - in some people taking a big bite of ice-cream (or anything cold) leads to a momentary sharp pain in the head. In English this sharp and painful feeling is called "brain freeze". Scientists have been trying to find the cause of this phenomenon for a long time. It seems that people suffering from migraines often experience this discomfort and it occurs to them more frequent than to other individuals who do not typically have headache problems. One of the causes of the so-called "brain freeze" is the change in the blood flow in this area of the head. Scientists have found that this type of headache is triggered by a rapid increase in blood flow in the anterior cerebral artery and it disappears when there is a contraction of the vessel. Experts speculate that this sudden onset of pain is a kind of defense mechanism of the brain against sudden changes in temperature. This mechanism is sensitive to temperature fluctuations and uses the flow of blood to ensure some heat, but the skull is a closed structure. Thus increasing the amount of blood leads to a change in blood pressure that causes pain. Before the vessels reach critical levels, however, the brain shrinks the vessels and the situation is normalized. Scientists believe the discovery of the relevance between the bites of ice cream and the occurrence of a sudden headache may lead to new ways of treatment to various types of head aches. That is why this discovery can be generalized as crucial for medicine and coping with migrene. I hope my observation helped you have a second thought if you suffer from headache and eat too much ice-cream.